Marble Hill City Hall, April 2014. Marble Hill is a fourth-class city in central Bollinger County in Southeast Missouri in the United States. Located at the intersection of State Highway 34 and State Highway 51, it is the largest city in Bollinger and serves as the county seat. The population was 1,477 at the 2010 census. The city was officially organized in July 1851 and is named after a marble-like rock. Marble Hill is part of the Cape Girardeau−Jackson, MO-IL Metropolitan Statistical Area. The area that would eventually become known as Marble Hill was established in 1842 as New California. Nine years later, it was renamed Dallas in 1851. As the area grew over the years, the First Baptist Church was built in 1856 near the oldest cemetery in Marble Hill. In 1862, the courthouse and town of Dallas was raided by Colonel S.D. Kitchen along with 120 Confederate soldiers. Finally, in 1868, the name of the town was changed again, this time to Marble Hill, to prevent confusion with the already existing Dallas County, Missouri. A year after the name change, a man by the name of Eli Lutes laid out what would become known as Lutesville. Lutes offered 10 acres (40,000 m2) to the railroad for a depot location which would be used as a shipping and trading point. Disputes with leaders of Marble Hill persuaded the railroad to relocate their route through Lutesville instead. In 1880, Will Mayfield College moved to Marble Hill from Smithville. It remained in operation there until its closing in 1934. In 1893, Wicecarver's Store was built across from the courthouse where the steps in front were formerly used for mounting horses and carriages. Between 1904-1905, the Mineral Well was dug on the courthouse square and was used until 1947-1948. The year 1932 marked the last passenger line on the Belmont Branch of the St. Louis & Iron Mountain Railroad. The railroad company ceased operations through Lutesville in 1973. In August 1953, an artesian well was discovered approximately 1,800 feet (550 m) deep while drilling for oil in the area. A few years later in 1973, voters approved a measure to build what would become known as Twin City Airport. Marble Hill is located at (37.304973, -89.976377). According to the United States Census Bureau, the city has a total area of 1.65 square miles (4.27 km2), of which, 1.64 square miles (4.25 km2) is land and 0.01 square miles (0.03 km2) is water. As of the census of 2010, there were 1,477 people, 604 households, and 369 families residing in the city. The population density was 900.6 inhabitants per square mile (347.7/km2). There were 705 housing units at an average density of 429.9 per square mile (166.0/km2). The racial makeup of the city was 96.41% White, 1.02% Native American, 0.81% Asian, 0.34% from other races, and 1.42% from two or more races. Hispanic or Latino of any race were 1.76% of the population. There were 604 households of which 30.8% had children under the age of 18 living with them, 41.2% were married couples living together, 15.9% had a female householder with no husband present, 4.0% had a male householder with no wife present, and 38.9% were non-families. 33.6% of all households were made up of individuals and 16% had someone living alone who was 65 years of age or older. The average household size was 2.32 and the average family size was 2.93. The median age in the city was 39.8 years. 24.8% of residents were under the age of 18; 8.9% were between the ages of 18 and 24; 20.5% were from 25 to 44; 24.7% were from 45 to 64; and 20.9% were 65 years of age or older. The gender makeup of the city was 43.4% male and 56.6% female. As of the census of 2000, there were 1,502 people, 642 households, and 414 families residing in the city. The population density was 935.9 people per square mile (362.5/km²). There were 719 housing units at an average density of 448.0 per square mile (173.5/km²). The racial makeup of the city was 95.67% White, 0.13% African American, 1.40% Native American, 0.80% Asian, 0.13% from other races, and 1.86% from two or more races. Hispanic or Latino of any race were 0.80% of the population. Among the major first ancestries reported in Marble Hill are 16.2% German, 14.5% English, 14.4% Irish, 11.4% American, 5.4% Dutch, and 3.4% French. There were 642 households out of which 31.8% had children under the age of 18 living with them, 46.6% were married couples living together, 15.6% had a female householder with no husband present, and 35.5% were non-families. 32.6% of all households were made up of individuals and 17.0% had someone living alone who was 65 years of age or older. The average household size was 2.31 and the average family size was 2.93. In the city the population was spread out with 27.2% under the age of 18, 9.1% from 18 to 24, 24.8% from 25 to 44, 20.0% from 45 to 64, and 18.9% who were 65 years of age or older. The median age was 36 years. For every 100 females there were 83.4 males. For every 100 females age 18 and over, there were 78.8 males. The median income for a household in the city was $22,163, and the median income for a family was $29,871. Males had a median income of $25,093 versus $16,161 for females. The per capita income for the city was $12,857. About 17.4% of families and 19.6% of the population were below the poverty line, including 24.4% of those under age 18 and 22.1% of those age 65 or over. 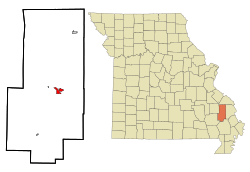 Marble Hill, Missouri Facts for Kids. Kiddle Encyclopedia.